Gas and dust disks around L1551 NE spotted by ALMA. Credit: ALMA (ESO/NAOJ/NRAO)/Takakuwa et al. With the Atacama Large Millimeter/submillimeter Array (ALMA) observation, astronomers led by Shigehisa Takakuwa, Associate Research Fellow at the Institute of Astronomy and Astrophysics, Academia Sinica (ASIAA), Taiwan, found spiral arms of molecular gas and dust around the "baby twin" stars, binary protostars. Gas motions to supply materials to the twin were also identified. These observational results unveil, for the first time, the mechanism of the birth and growth of binary stars, which are ubiquitous throughout the universe. The study was published on November 20 in The Astrophysical Journal. Compared to single star formation, our understanding of binary star formation has been limited. However, more than half of stars with a mass similar to that of the Sun are known to be binaries, and it is thus crucial to unveil the physical mechanism of binary formation observationally to obtain more comprehensive understanding of star formation. Theoretically, a disk surrounding the "baby twin" stars is considered to feed materials to the central baby twin stars and grow them. While recent observations have found such disks surrounding the baby-twin stars, named "circumbinary disks," those observations could not image the structures and gas motions of the disks to feed materials to the binary, because of the insufficient imaging resolution and sensitivity. 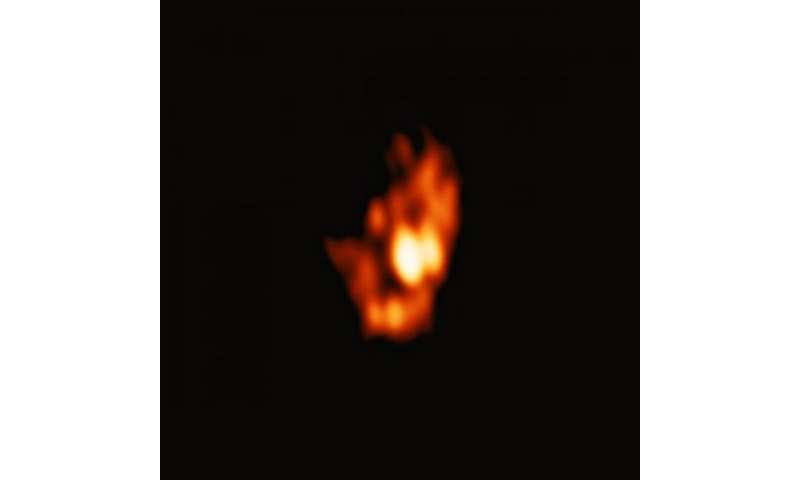 The research team, led by Shigehisa Takakuwa, used the ALMA telescope to observe the baby-twin star L1551 NE, located in the constellation of Taurus at a distance of 460 light years, with a 1.6 times better imaging resolution and a 6 times better sensitivity than those of their previous observations with the SubMillimeter Array (SMA). They observed L1551 NE in the emission from dust at a 0.9-mm wavelength, a tracer of distribution of interstellar materials, and carbon monoxide molecular emission, which can be used to study gas motion with the Doppler Effect. 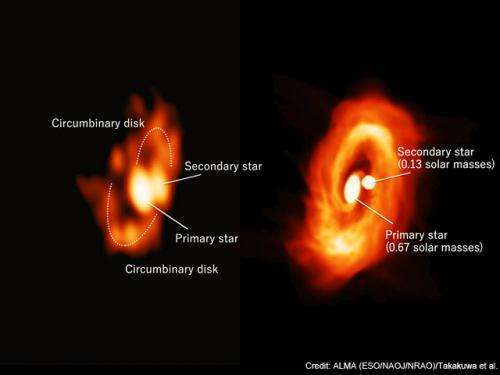 They found a gas component associated with each binary star (the two central components can be seen in Figure 1), and a disk surrounding both stars, a circumbinary disk, with a radius of 300 au. The radius corresponds to 10 times the orbital radius of Neptune in our solar system. For the first time, they succeeded in imaging the detailed structures of the circumbinary disk, and found that the circumbinary disk consists of a southern U-shaped feature and northern emission protrusions pointing to the northwest and the northeast (Figure 1). To understand these newly-identified features, the research team constructed a theoretical model of binary formation in L1551 NE, shown in Figure 2 (right, see also the attached movie), using the supercomputer, "ATERUI" at the National Astronomical Observatory of Japan (NAOJ). As shown in Figure 2, the southern U-shaped feature and northern emission protrusions observed with ALMA can be reproduced with a pair of spiral arms stemming from each baby twin. The research team also investigated the observed gas motion as seen in the carbon monoxide molecular emission, and identified faster rotating motions in the spiral arms and slower rotating motions in the inter-arm regions. The inter-arm regions also exhibit a falling gas motion toward the central baby twin stars, namely, the ongoing feeding process of the materials to the baby twin stars. These results show that the baby twin stars "shake" the surrounding circumbinary disk and induce the falling gas motion to feed the materials to the baby twin. "Our high-resolution ALMA observation has unveiled live images of the growth of the baby twins for the first time," said Takakuwa. Tomoaki Matsumoto, a professor at Hosei University, who constructed the theoretical model with the supercomputer, said, "Our ALMA observation has revealed gas feeding to the baby twin stars from the surrounding disk. Our ALMA results match with our theoretical prediction remarkably accurately". Kazuya Saigo, co-principal investigator along with Takakuwa, explained, "We succeeded in unveiling structures and motions in the circumbinary disk with such a high accuracy, because of the high imaging resolution and sensitivity of ALMA. In this ALMA era, high-resolution ALMA observations coupled with thorough numerical simulations will be more and more important. Our research on L1551 NE using ALMA and theoretical modeling using a supercomputer can be regarded as an upcoming research trend." More information: These observational results were published in The Astrophysical Journal as Takakuwa et al. "Angular Momentum Exchange by Gravitational Torques and Infall in the Circumbinary Disk of the Protostellar System L1551 NE" in November 2014.